The Paris climate talks are coming soon. Jess Worth and Danny Chivers ask - What can we hope for? At the end of September 2015, something important and surprising happened. 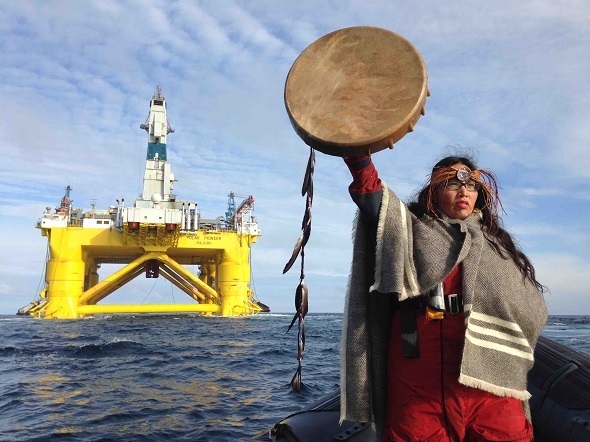 After 10 years and $7 billion, Shell stopped its plans to drill in the Alaskan Arctic.Shell did not make the decision because of government action or international climate agreements. It was because of years of public protest, direct action, online organizing and legal challenges – especially by Indigenous communities. The protests delayed the project and made it more and more expensive. Then there was the big fall in the oil price and the technical problems of drilling in the Arctic. And so suddenly there were only a few months to drill. That failed and it was the end for Shell. Suddenly the campaign to save the Arctic is keeping more fossil fuel in the ground than 23 years of international climate negotiations. The media give the idea that this will all change at the Paris climate talks, and that a ‘good deal’ on climate is finally possible. Let’s be clear. Paris is not going to make a plan to stop climate disaster. It will be easy for the big polluters. Nnimmo Bassey is a Nigerian campaigner. He says that we already know the result - a list of promises that no one will have to keep. Pollution will continue. We already know that the emissions cuts the polluting countries are going to promise will not be enough. They won’t keep temperature rises below three degrees. That means islands will disappear, cities on the coast will have flooding, we will lose some animal species, there will be bad droughts and very bad weather. Adesuwa Uwagie-Ero is another Nigerian activist. She says that in the climate change meetings the powerful nations win against the weak nations and do what is best for their own national interest. She says that nations like the US, Canada, Japan, and Australia make things difficult and climate change problems continue. She says that this started with the COP15 in Copenhagen, and gets worse with each COP. There is a second big problem. Most big companies do not want to stop using fossil fuels and they have power over many governments. Aneesa Khan is a youth delegate from India. She has been to the climate talks and she says big companies have power over everything. She says that a lot of the plans by governments are very good for the fossil fuel industry. There is a different way. We can see this from the way Shell’s Arctic drilling plans were stopped. Martín Vilela is from the Bolivian Platform on Climate Change. He says that before we thought a strong international deal was possible to change politics at the national level. He thinks that now it needs to work the opposite way with the people fighting back against the system. Then there will be other bigger changes. Protests against fossil fuels are growing fast. They can continue to stop fossil fuel extraction on the ground by stopping new power stations, fracking wells, and pipelines. People protests could protect forests and soil by defending the rights of Indigenous peoples and supporting small farmers. Then communities can have action plans for clean energy. Then, perhaps, we can force our governments to think about climate change. With divestment in the fossil fuel industry and campaigns against sponsorship, this could create a very different politics where a good climate deal is possible. Tha doesn’t mean we should forget this year’s climate talks. Majority World campaigners and activists from around the world see three areas for Paris action: supporting Southern negotiators; protest against the rich governments’ ideas; and helping the climate justice movement. Some Majority World countries have been fighting in the talks. Tuvalu, Sudan, Bolivia, and Venezuela were against the sad ‘Copenhagen Accord’ in 2009. Sudan’s negotiator said climate change is a future with millions of deaths in Africa. The following year, Bolivia’s negotiator, Pablo Solón tried to stop the terrible deal. The media wrote about Filipino Climate Commissioner Yeb Saño at the Warsaw talks in 2013 when he wept after Typhoon Haiyan hit his town. Then he joined the protesters to ask for bigger protests. Threats and bribes have stopped the protests of these countries and their negotiators have “gone away”. Negotiators from communities who are in great danger have little or no influence at the meetings. 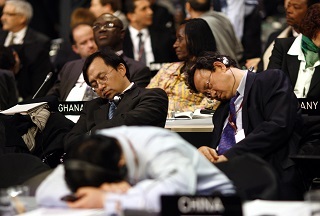 Sometimes they are shut out of the talks, as at Copenhagen. We can understand why we could forget about or stop the Paris talks. Asad Rehman is from the Friends of the Earth. He says many people think that will not help and it will make things worse. He says that the US would like the negotiations to end so it can move these discussions into the G8, Because in the UN all countries have a voice and a vote. Maria Alejandra Escalante is a youth representative from Colombia. She agrees: ‘We need to have a voice in the UN, because they have power. We do not think that the UN is useful but we need to control damage. The promises about emissions cuts at Paris will be very small. But there are important ideas in the text that Southern negotiators are fighting for. One is the principle of Common but Differentiated Responsibility. The US hates it and its negotiator is warning ‘if equity’s in, we’re out’. Another idea is the transfer of funds and technology from the North to the South. This is very important for clean development, and to help with the big climate problems which will come. There are also many things in the talks we need to oppose, such as the use of carbon markets. South American countries and their friends have slowed them and they will need to do so again. Tom Goldtooth is the leader of the Indigenous Environmental Network. He has a long list of dangerous technofix ‘solutions’ that could also be in the deal. He says carbon capture and storage, genetically modified organisms and geoengineering, synthetic biology and nanotechnology, agrofuels, fracking, nuclear projects and energy from burning waste. All these will do more harm than good to the Earth. The UN climate negotiations are about more privatization of nature. Indigenous communities, he says, are forced to negotiate with these wrong capitalist solutions to defend their rights. For the Paris meeting, social movements must be very careful about what they say. The story from protests and marches must be right. Some organizations are getting it very wrong. We were not happy in July when online Avaaz sent an email - ‘Five months to save the world’. This gave the idea that the Paris meetings can decide the future of the planet. It was like Copenhagen in 2009 when campaigning organizations gave their supporters so mcuh hope. Failure or despair followed. Or what was worse, people thought there was some kind of success and this meant governments were free not to take serious action. Thankfully, this time things will be different. Global campaign group 350.org is not expecting very much from the Paris meetings and they see them as a step not as the end. It has also joined with the Global Campaign to Demand Climate Justice. This is a group of Southern people organizations and progressive NGOs. They want to try not to call for ‘climate action’ and not say exactly what that is. The ‘People’s Test on Climate’ has a clear set of ‘climate justice’ actions that a Paris deal will need to be a success. These include a change to clean energy, the right to food and land, and justice for those in most danger from climate change. The biggest opportunities at Paris may be outside and not inside the meetings. Aneesa Khan says that we need to see Paris as a step, a moment when people can meet and organise for the stronger society that we need. A large number of campaigners and activists are planning to go to Paris or go onto the streets at home. There are plans for very big marches and a lot of direct action. Perhaps governments have not changed since Copenhagen, but the climate movement has. Campaigners are not calling for a ‘good deal’, but are going to Paris with criticism of capitalism, economic growth, environmental racism, and white privilege. Unions will demand climate jobs and support refugees. Campaigners will talk strongly about the need to resist trade deals that could make climate regulation illegal. Asad Rehman says that as companies want to use more and more dirty energy, people are organizing to change the climate movement away from a small white middle-class group. Clean energy is getting cheaper very quickly and taking an important part of the market. The oil and fracking industries are starting to suffer from the cheaper oil price and from campaigns against them. Institutions worth $2.6 trillion have now promised to divest from fossil fuels. It is now possible to elect leftwing, climate-friendly candidates in politics in Europe. And the Pope’s strong opinions on climate are influencing faith communities and making world leaders think. We are finally seeing the first beginnings of a global movement that could become strong enough to change politics on climate. We need to lead, so the politicians must follow. But we have to move fast, as time is short to stop temperature rise. Paris is going to be very emotional with successes and failures. ‘People often ask: “Why fight for these things at the talks if you know you’re not going to win?”’ says Lidy Nacpil. She is a long-time social justice campaigner from the Philippines and co-ordinator of Demand Climate Justice. ‘When we begin a campaign, we never say “Wait – let’s see if we’re going to win before we decide to fight. We always start from a weak position and this is why we need to fight." This page was last edited on 10 November 2015, at 20:45.